The Nexus 5 Android smartphone is anticipated to be launched next week, and the closer we get to the official unveiling the more we are hearing about this device. In the last day there have been further leaks about the Nexus 5 and Android 4.4 Kit Kat, and now the Nexus 5 release is one step closer after one more hurdle has been passed. We recently heard of some leaked pricing for the Nexus 5 and also some further release news. It now looks as though October 15 is the day when the Android 4.4 KitKat OS update will be launched and also released. The Nexus 5 is also expected to be introduced on that same date, with a release due later this month. Last month the Nexus 5 made its appearance at the FCC, and we hear that the device (LG model D821) has now passed through the Bluetooth SIG. Thus it appears that everything is nicely on schedule for the phone’s launch and subsequent release. Although nothing has yet been confirmed the Nexus 5 has been the subject of plenty of leaked specs that have been cemented further over the last few days. The phone seems likely to be powered by a 2.3GHz Qualcomm Snapdragon 800 quad-core processor, have a 4.95-inch Full HD display, 2GB of RAM, and 16 or 32GB of internal storage. Other expected specs include an 8-megapixel rear camera (see more about the camera here), a 1.2-megapixel front-facing camera, and 2300 mAh battery. More leaks have now arisen for the Android 4.4 KitKat update and Nexus 5 from a hands-on experience. 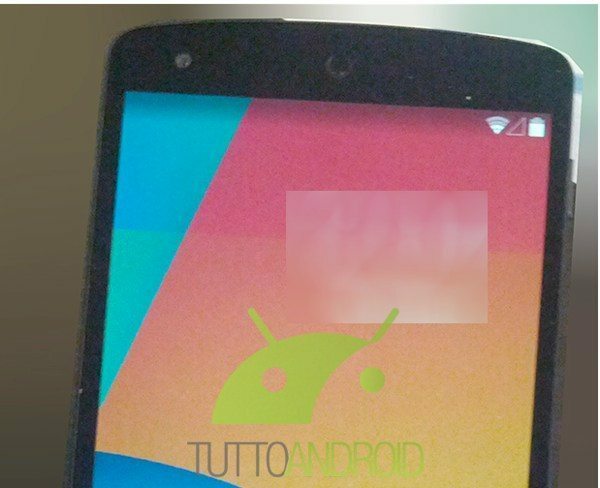 New pictures have emerged of Android 4.4 and also the Nexus 5 handset, and these give a really good look at what we can expect. The latest leak gives a look at the UI changes for Android 4.4 with new notification bar, launcher button, Dialer icon, camera icon, ‘tap and pay’ section, and much more. For the Nexus 5 handset itself we can see the front-facing camera at top left, circular speaker grille and on-screen navigation buttons. We’ve published a couple of these images here but to see much more head to Tutto Android (Google Translated). There are only a few more days until October 15 so it shouldn’t be too much longer until we can bring you official Nexus 5 specs, availability, pricing and more. Are you one of the many Android device enthusiasts who cannot wait to get their hands on the Nexus 5 as soon as it releases? Is it the pure vanilla Google Android experience that makes this phone so appealing to you? Let us have your comments.